The Asokwa Area Head of The Church of Pentecost (COP), Apostle Ekow Badu Wood, has stressed the need for contemporary Christians to adopt modern media platforms as vehicles for spreading the basic message of Jesus Christ. According to him, unlike the conventional modes of evangelism, many people can be reached through media at any given time. In view of this, he stated that it is imperative for church leaders to update themselves in the use of modern technology to reach more souls and also disciple the youth, who forms a majority of the COP membership, in this regard. Speaking on the topic: “Spreading the Basic Message through the Media” based on 1 Samuel 17:37-41, he pointed out that David could not use the modern technology of his days which was Saul’s armour because “he was not used to them”. He, therefore, went out to face Goliath with obsolete technology. “David recognised his limitation on the battlefield when he had to use Goliath’s sword, having earlier rejecting Saul’s sword, to cut off his (Goliath) head,” he stated. The Asokwa Area Head further noted that David later had to resort to the technology he had earlier abandoned to accomplish his God-given assignment. “This proves that we need a good combination of the unction and technology to take over the nations for God,” he noted. According to him, the “Basic Message of Jesus Christ”, which he defined as “the Gospel of Salvation”, is captured in the Four-Square Gospel; Jesus Christ is our Saviour, Healer, Baptiser with the Holy Spirit and Soon-coming King. Apostle Badu Wood concluded that The Church of Pentecost has outlined the basic message of Jesus Christ in the Eleven (11) Tenets, which serves as the bedrock of the Church’s doctrines. Touching strongly on the 11th tenant, Marriage and Family, the Asokwa Area Head averred that the Church can make the maximum impact if marriage and family systems are used to raise God-fearing and responsible children since the family is the dispenser of civility and character. 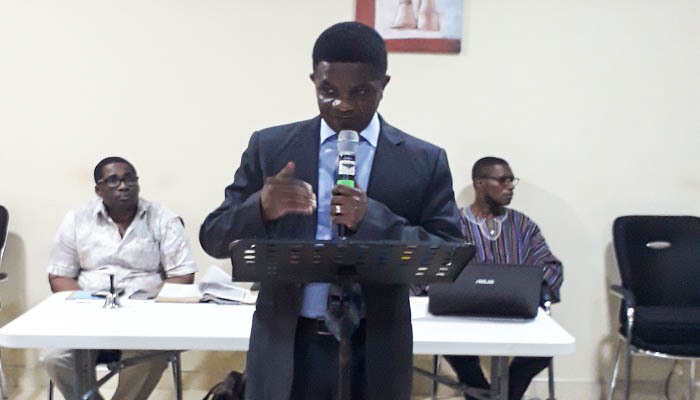 Apostle Ekow Badu Wood, who is also the Chairman for the Ashanti Regional Coordinating Council, made these observations when he was delivering the opening address at the 11th Session of the Annual Media Ministry Seminar currently underway at the Pentecost Convention Centre, Brofoyeduru at Kumasi in the Ashanti Region. The seminar is organised annually by the Media Ministry Committee chaired by the Apostle Eric Nyamekye. The event is being held under the auspices of the Media Ministry Pastor (MMP) of the Church, Apostle Daniel Tetteh Tackie. The annual seminar aims at equipping Radio Ministry pastors and other officers from all the 63 areas of the Church to effectively use the broadcast media to preach the gospel message of Jesus Christ. A total of 100 participants are undergoing the training.